No more bagging or slicking! 3 to 5 times faster! The Thin Line Mortar Pump was designed with the masonry, tile, restoration, stone, and paver contractor in mind. It fills a definite need by eliminating the slow process of bagging and slicking mortar into joints. It does a neater job, and that means less clean-up time. Dramatically reduces labor costs! The electric pump operates at variable speeds from 0-2 gallons per minute. Higher speeds permit efficient grouting of large voids, door jams, etc. The hopper holds 4 cubic feet of mortar and pumps 50 feet straight up. With the addition of a spray gun and compressor the pump can also be used for spraying mortar and texture coating. The machine comes with a 3/8″ nozzle tip, 50 feet of 3/4″ hose and a 75′ external on and off switch. The pump operates on 110 volts and is made of long-lasting heavy gage steel construction. The Thin Line Mortar Pump can be taken up on a scaffold with ease. Works as well on the underside of arches and soffits as it does on vertical walls and paving. 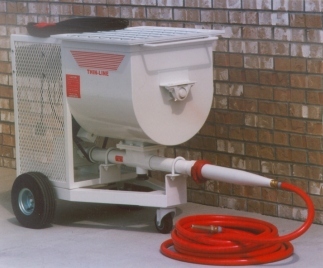 The Thin Line Mortar Pump was developed by a masonry contractor with 34 years experience. That’s why it’s truly practical equipment, with features only a working contractor would design on it. And, it has been job-tested for over 18 years on more than 100,000,000 bricks.